The Commission on Accreditation of Ambulance Services (CAAS) has achieved accreditation from the American National Standards Institute (ANSI) for its standards development program. 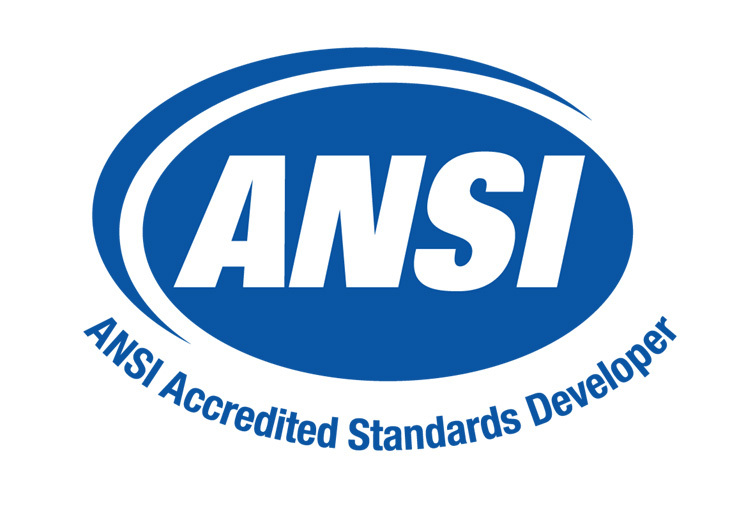 Mark Postma, CAAS Chair, said, “We are incredibly proud of this achievement which demonstrates CAAS’s ongoing commitment to quality and excellence in standards development.””ANSI commends CAAS for achieving accreditation as a standards developer,” said Lane Hallenbeck, ANSI vice president of accreditation services. “This recognition is a public statement of the value that CAAS places on an open and equitable consensus development process.”ANSI fosters the U.S. standardization system by accrediting the procedures of standard-setting organizations and subsequently approving individual documents as American National Standards (ANS). Over 230 ANSI-Accredited Standards Developers are now engaged in the creation and maintenance of voluntary consensus standards that are being used in virtually every industry sector. 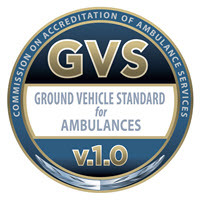 The Ground Vehicle Standard (GVS v.1.0) has been finalized and published by the Commission on Accreditation of Ambulance Services (CAAS) on March 28, 2016. The effective date of the Ground Vehicle Standard (GVS) is July 1, 2016. Mark Van Arnam, founder and CEO of American Emergency Vehicles, has retired from the North Carolina based manufacturer of ambulances. “It is extremely difficult to leave AEV”, stated Van Arnam. “But, the company is performing well, and is run by a strong team.” Mark has been in the ambulance business for over 45 years, and is looking forward to some new challenges. Please visit our GVS website at www.groundvehiclestandard.org for up-to-date information on GVS. 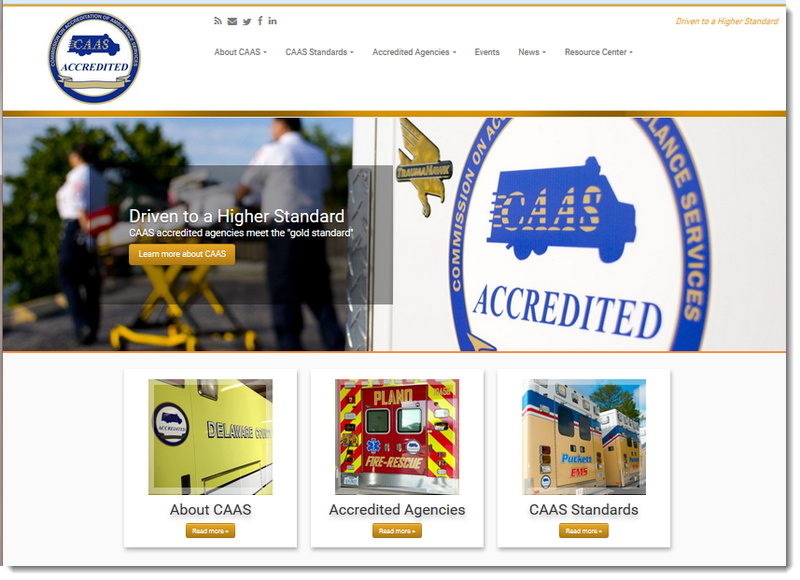 The CAAS website (www.caas.org) has been revamped and redesigned with a modern look and responsive, mobile-friendly design. The new site is designed to illustrate the benefits of accreditation to those considering it, and to highlight agencies who have already achieved accreditation. To give the site a dynamic look, we plan to feature accredited agency photos throughout the site. We only require two things: every photo must have the CAAS logo visible somewhere in the photo and the agency needs to complete a photo release form. If you would like to share one of your photos, please visit the site’s new Resource Center. CAAS will soon begin the process of reviewing the current CAAS Standards (Version 3.0) per the ANSI accredited standards development process. If you are interested in learning more about the CAAS Standards revision process, please contact CAAS headquarters at 847-657-6828. The Commission on Accreditation of Ambulance Services (CAAS) is pleased to announce the continuation of its accreditation grant program. As part of an effort to make accreditation more accessible and affordable to qualified agencies, CAAS will be offering limited grant funding toward the accreditation application fees. The CAAS grant funding will cover the application fee for accepted agencies, in an effort to reduce the financial impact of initial accreditation. CAAS will continue the grant program again this year, and will be accepting applications for consideration soon. Watch for an upcoming announcement shortly. In February, the CAAS Panel of Commissioners granted CAAS accreditation to three new agencies: Lifeguard Ambulance Service (Mobile, AL), Maitland Fire Rescue (Maitland, FL) and Symons Ambulance (San Bernardino, CA). With the increased number of agencies applying for accreditation, it is imperative that re-accrediting agencies submit their applications by their assigned in house due date. Deadlines for submission are currently six months prior to your agency’s expiration date. The entire six months is necessary to ensure your agency completes the full off and onsite process and is presented to the Panel of Commissioners before your expiration date. 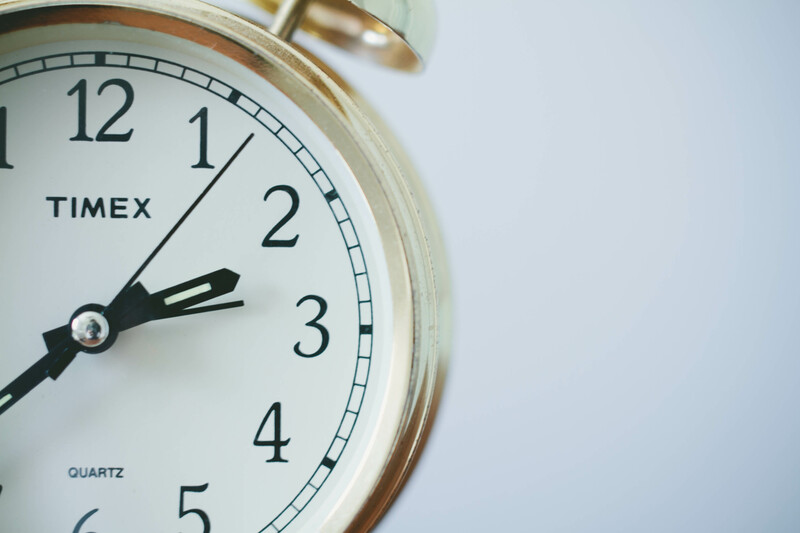 Late submissions cannot be “fast-tracked”, and failure to submit your re-application materials to CAAS by the deadline will likely result in the temporary loss of accreditation status. Remember that accreditation is a process, not a project. The process of monitoring your organization against the CAAS standards should not stop once you become accredited. Resist the urge to shelve the CAAS standards until it is time to re-accredit. Continue to evaluate and monitor your operation’s procedures, forms, policies, reports and culture to ensure that your organization remains compliant with the standards. A lot can change over the course of three years – make your re-accreditation easier by establishing routine CAAS check-ups. It is much easier to ensure that your routine organizational changes are CAAS compliant as you go along. Please plan enough time to properly assemble your application and documentation materials to ensure that your agency submits its re-accreditation materials on or before the submission deadline. If you are uncertain of your agency’s submission due date, contact the CAAS office at 847-657-6828. Have you visited any of our social media networking sites yet? CAAS is active on Facebook, LinkedIn and Twitter. Check in daily for the latest updates and announcements about CAAS and our accredited agencies. Get advanced notice of upcoming seminars, events and webinar sessions. Share some of your photos and accomplishments with others, and join in on discussions related to CAAS accreditation. Visit our sites and share with others to help us grow! CAAS will be exhibiting at these upcoming meetings – please plan to stop by our exhibit booth.